To be able to efficiently search for biological samples for biomarker research a certain infrastructure is necessary. This infrastructure is being provided by the research infrastructure BBMRI-ERIC, which was founded in 2013 and is today’s largest scientific health infrastructure in Europe. Currently BBMRI-ERIC has 19 member states. The European cooperation allows the partners to access biological resources and biomedical installations in order to support efficient and excellent biomolecular and medical research. 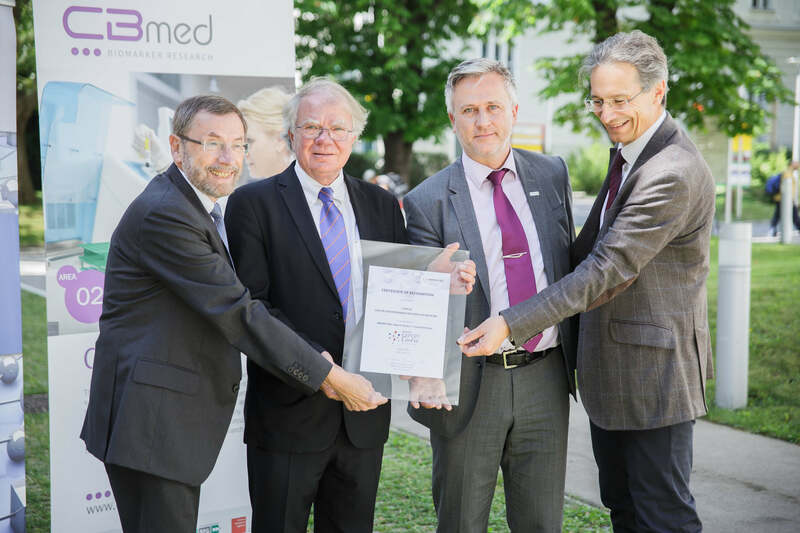 The “Center For Biomarker Research In Medicine” in Graz, Austria (CBmed GmbH) is linking the scientific expertise of the medical universities of Graz and Vienna to innovative technologies of leading international companies in the fields of pharmacy, diagnostics, and medical technology and therefore helps to improve the diagnosis and treatment of cancer, metabolic diseases, and inflammations in the future. The award as “BBMRI-ERIC Expert Centre/Trusted Partner” proves for future partners that the analysis of samples happens under strict quality control at the labs of CBmed.